It’s PODCAST day!! We’ve been so inspired this past week by others’ stories of taking big risks, that we thought we’d share our own personal stories of quitting jobs, changing directions, and finding our happiness. Listen to hear some of the risks we’ve taken in life + how that’s made all the difference! This week Liz + Lina, big beer lovers, interview Per-Erik Alm, the brewmaster at Bryggeriet Ångkvarn in Uppsala, Sweden. Per-Erik got into the business by marriage and a love of beer. He and two great-grandchildren to the original brewery founder, H.W. Söderman, teamed up to create a family-run brewpub in the same place as the original steam mill brewery. Listen to hear more stories + info about the brewery and our love for beer! On weekdays, I usually set the alarm for 06.30 in the morning, however, I’ve gotten into snoozing a lot, so it ends up being more likely around right before 7. I start work at 8. I used to be able to snooze for at least 45 min (BUT, I set my alarm earlier as well then..). I love mornings on the weekends, and I really wanna enjoy them as much as possible, so I always ask Liz to make sure I’m awake at the latest 08.30. What’s the first thing you do every morning? Check my phone, then go to the bathroom, either take a shower and get ready or just get ready. 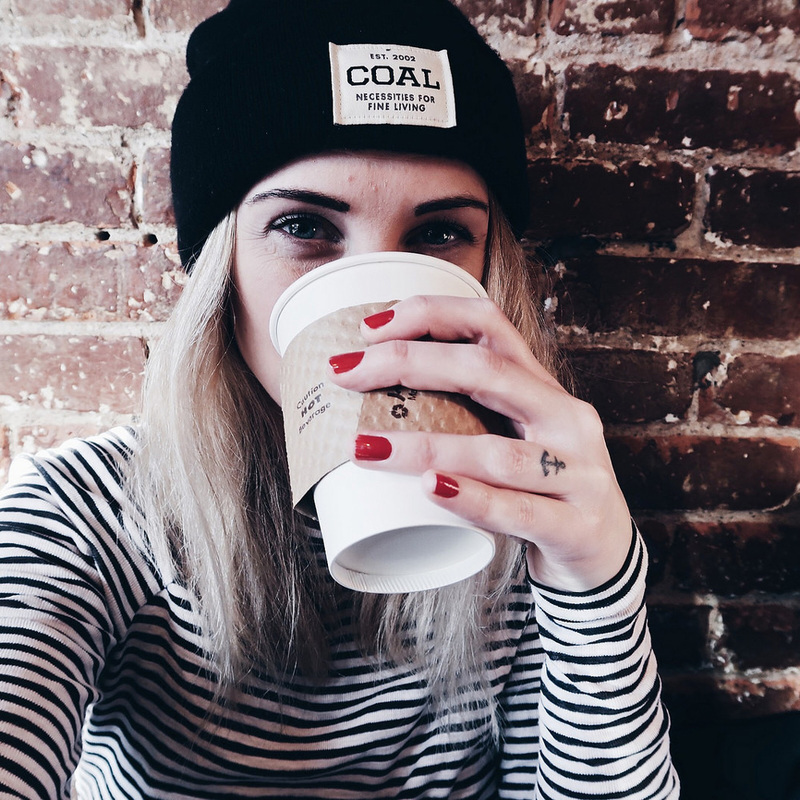 Afterwards, I head to the kitchen, and grab a cup of coffee, and try to decide what to wear. Once that’s decided, I usually sip on my coffee until it’s time to walk to work, which is usually around 7.50. How much time do you spend in the bathroom every morning? If I take a shower, it takes around 45 min to an hour. If I’m not taking a shower, around 30min – with clothes issues, 45min though. Yes. Since I’m only working 2 hours in the morning, I usually eat it when I come back home from work, around 10. If for some reason, I have been extra fast, I might eat breakfast before work. Two sandwiches with butter and cheese, coffee, and a glass of juice. Sometimes, one sandwich and yogurt with müsli. Are you tired in the mornings? What kind of alarm do you have? I use my iPhone and wake to the beginning of the song Glory Box by Portishead. What does a perfect morning look like to me? At home: To wake up with Liz by my side. It’s summer and we’re both off from work with no specific plans, so we’ve got the whole day together and can just do whatever we feel like. Perhaps take the short train ride to Stockholm for shopping, dinner, and beer. But the feeling of knowing we’re together with no specific plans. At the beach: To wake up, with Liz by my side (but she’s usually already up, though, which is fine! ), the sun is shining and I know it’s a hot and humid day. I grab a cup of coffee and walk out on the deck with an ocean view. Family members are already sitting there, sometimes reading a book, sometimes chatting, and I’m joining the crowd. We eat breakfast, change to bikinis, and then walk the short way to the beach for a relaxing day, together. What’s the best with mornings? You have the whole day in front of you with endless possibilities. How are you dressed in the morning? PJ’s and then my kimono or cozy clothes, which is soft pants and a big t-shirt or a tank. Screw the traditional Valentine’s Day talk! 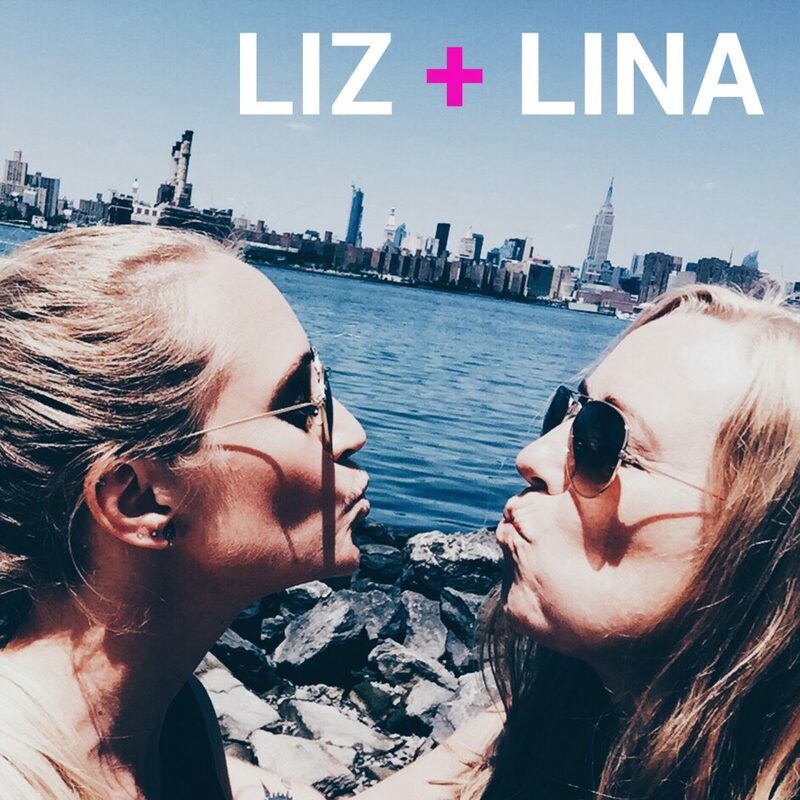 While we are talking all about love today, we decided to give it a little Liz + Lina twist. Tune in to Episode 19 of the LIZ + LINA podcast to hear how we both struggle with loving who we are, plus some of the strategies we use to help us learn to better take care of ourselves. Remember… it all starts with you. So, love yourself! When you walk and suddenly it’s just there. A sweater, a dress, a notebook, or a bag. That happened to me the other day. I found an awesome bag, and just because I love it so much, I’ll show it to you here too. Sorry, but not sorry. Would you rather eat out or have delivery?! Liz + Lina draw some fun, random questions in this week’s episode so be sure and listen to learn a little more about the girls, enjoy a few laughs at their expense, and try to guess what they will say. (Hint: Liz + Lina are not exactly on the same page about everything). And of course, get an update on how things are going with their lives + their weekly challenges. My debut on American TV! Hey! Long time no see, but here I am. Gosh, once I really sit down and blog, I realize how much I actually miss it. Anyhow, as the title of this post says, today is the day. Liz and I are going to be on Home & Garden Television (HGTV) on the show called, House Hunters International. Yep, that’s right! The channel found Liz’s blog back in winter of 2015, but we weren’t ready to move to our own place then. However, HGTV told us that they still really wanted to film an episode with us, and that they would wait until we were actually gonna buy a home. Life happened and the time came for us to purchase a place, we contacted HGTV, and we filmed a day in Asheville, NC in the States this past summer, and then filmed four days here in Uppsala, Sweden. Intense days but so much fun!! The time has now come and it’s gonna air on TV TONIGHT in the States!! 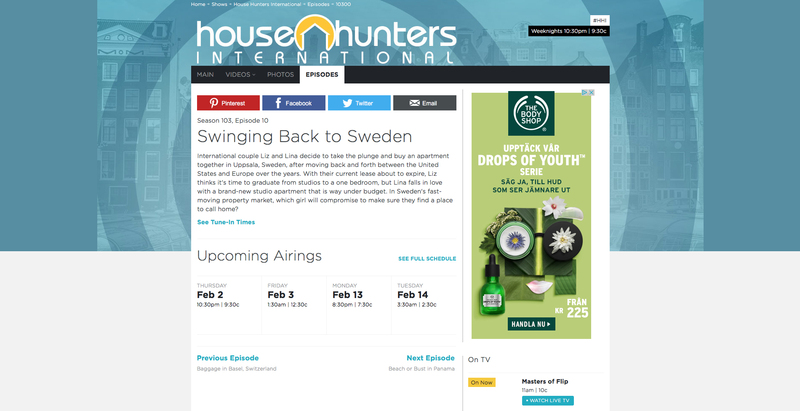 So if you have HGTV, our episode, “Swinging Back to Sweden”, will be on at 10:30PM Eastern time. You can read more about the episode here which will take you to the website of House Hunters International, and basically what you see down below. Liz and I have, of course, a lot of footage from summer and fall, when we filmed, which we will post on our YouTube channel (which I’ve forgotten to mention on the blog yet, but in our latest podcast!). However, if you would like a little taste of it, you can watch the Casting Video we filmed. Even though the show hunted us, we still had to go through all the paperwork and process of being casted. Check out the casting video here below. Also, for future references, we will post, as I said earlier, more video footage later on, so hit the subscribe button on YouTube, and tag along on this TV adventure of ours! Search liz+lina on YouTube or click on this direct link here in order to get to our channel. A couple of American papers have also written about us and the upcoming show as well, which you can find here. Mountain Xpress, here, and Citizen-Times, here. We’ve also been interviewed by the local paper in Uppsala, but when I’m typing this, it hasn’t been published yet (if it will?!). So, I believe that’s it for now. I’ll post, once the episode has been aired, a bunch of behind-the-scenes pictures, a little more info, and videos. It will probably end up being several parts because we have so much fun material to share with you! What a crazy and amazing adventure this has been and still is!